Good news for fans in the 80s-90s who love Hong Kong and Taiwan’s artist. Soon will be has concert of the famous Hong Kong’s artist to perform the show in Thailand. The artist will be “Chan Yick-shun (Eason Chan)”. Eason Chan is on the threshold of major stardom in Hong Kong and undoubtedly one of the most dominant male singers in the post-1997 era of Hong Kong music industry. Praised by Time magazine as a front runner in the next generation of Cantopop and the star was crowned “King of Asian Pop” by Time Out Hong Kong in 2012. With a new concept concert tour entitled “EASON’S LIFE”, the show has received rousing success since its launch at the Hong Kong Coliseum on 6th July 2013, and unexpected and overwhelming ticket demand had led local Hong Kong promoter to answer fans’ call for more shows, increasing his show performances from the initial 12, to 17, to 20, to 23, and lastly to the final count of 25 shows held in Hong Kong alone over a month long period. Furthermore, Eason had create new history for the Chinese music industries, he was the first Chinese artist perform his “DUO” Concert at the O2 Arena in England in April 2012, that hold 12,000 fans from many countries such as China, Hong Kong, England, Germany, France, Belgium, Luxembourg and Spain. This concert was received excellent response from the Europeans and the tickets sold out within 20 minutes, as soon as they open to reserve. 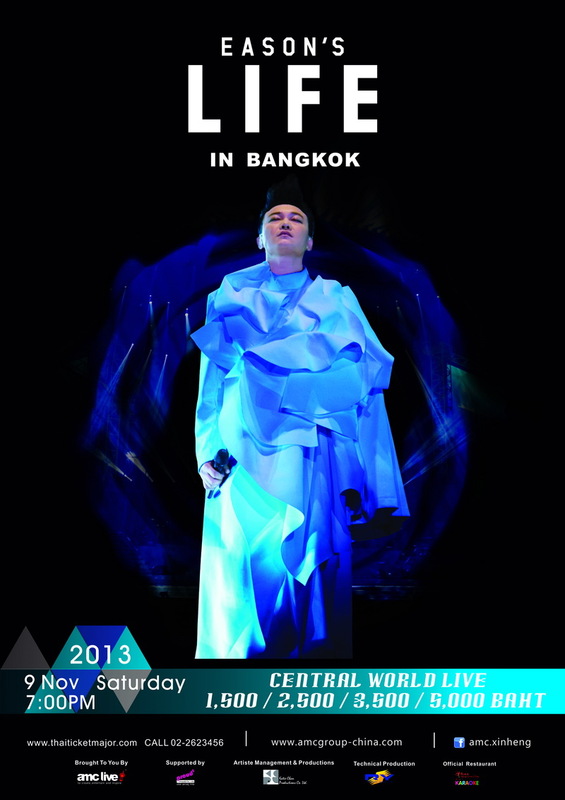 For Eason Chan’s first Concert in Thailand “EASON’S LIFE IN BANGKOK" Brought to you by AMC Live Group will perform on 2013 November, 9th (SAT) at Central World LIVE (Floor 8th). The show will be start at 7:00 pm. Ticket price are 5,000/ 3,500/ 2,500 and 1,500 baht. All tickets will be on sale on September, 14th at ThaiTicket Major all branch, Tel. 02-262-3456 or www.thaiticketmajor.com.